The impact of New York’s High Line has rippled far beyond the Hudson River. Cities across the world are clambering around, desperate for their own version of the celebrated elevated linear park. Amongst the controversy of the Garden Bridge in London and the high-tech proclamations for the Lowline in Chicago, is the Peckham Coal Line. What makes this project unique is that it was proposed by the local community, for the benefit of the local community. The Peckham Coal Line is to be a 900m-long linear park that runs on disused coal sidings alongside the railway line. The new urban park will connect the communities of Queens Road and Rye Lane, providing a much-needed retreat for pedestrians and cyclists from the areas’ congested roads. Regeneration in recent years has brought many changes to the diverse communities in Peckham, and it is hoped that the Peckham Coal Line will spread some of these benefits more evenly, as well as attracting new visitors to the area. The Peckham Coal Line began as a university project for Nick Woodford, a mature architecture student at Central Saint Martins. The project has now very much left the hypothetical confines of the university studio, and becomes more of a reality with every passing day, with the help of a small team of volunteer professionals. The team have had a busy year, negotiating with Network Rail, carrying out community consultations and events, and launching a crowdfunding campaign. The group aim to raise £65,000 in order to carry out a feasibility study, examining how the Coal Line will be built, as well as engaging residents, businesses, schools and commuters in further workshops. The campaign has already raised over 55% of this target, including a £10,000 pledge from the Mayor of London. The local community has guided the design of the Peckham Coal Line from the outset. The depth and commitment to inclusive participatory design was evident as I was led on a walking tour of the Coal Line as part of the Open House London 2015 weekend. 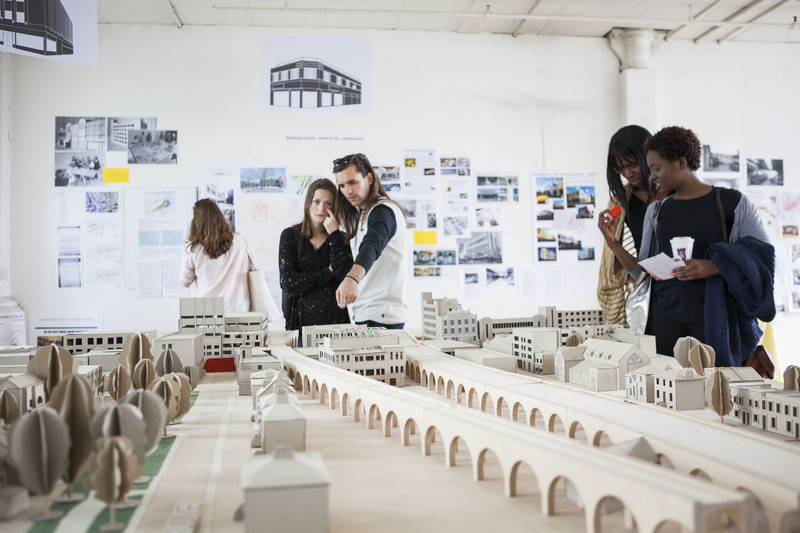 The designers have considered how to draw crowds to areas currently blemished by anti-social behaviour, navigated residential sites to ensure parking spaces aren’t lost, reconnected busy streets to forgotten parks and nature reserves, and explored ways for creating new spaces for local businesses under the railway arches. The group are also casting their eyes further afield, in order to link up to other areas of green infrastructure in the southeast. There is an ambition to provide an uninterrupted green ribbon from Peckham all the way up to Rotherhithe, where Sustrans is proposing a new walking and cycling bridge over the river to Canary Wharf. The project will be leading another walking tour of the Peckham Coal Line on October 10th. For more information and to donate to the crowdfunding campaign, visit www.peckhamcoalline.org.